In this stimulating volume, Larry D. Barnett locates a fundamental defect in widespread assumptions regarding the institution of law. He asserts that scholarship on law is being led astray by currently accepted beliefs about the institution, and as a result progress in understanding law as a societal institution will be impeded until a more accurate view of law is accepted. This book takes on this challenge. 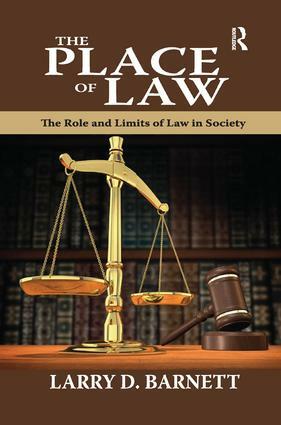 The Place of Law addresses two questions that are at the heart of the institution of law. Why is law an evidently universal, enduring institution in societies characterized by a relatively high level of economic development and a relatively high degree of social complexity? And why do the concepts and doctrines of the institution of law differ between jurisdictions (states or nations) at one point in time and vary within a particular jurisdiction over time? These two questions, Barnett believes, should be prominent in any study of law. The framework for law Barnett proposes is concerned with activities that are fundamental aspects of social organization, that is, activities that are deeply embedded in social life. His viewpoint is grounded on a body of quantitative research pertinent to the societal sources and limits of law. Barnett argues that this perspective applies only to law in sovereign, democratic nations that are economically advanced and socially complex. In other environments, law's place as a societal institution is less secure. This innovative perspective will do much to enhance understanding and appreciation of the role of law in modern societies.